Today, we’re still headquartered in Geelong in the heart of the world’s finest quality wool-growing district and just minutes from the world-renowned surf beach, Bells Beach, on the Great Ocean Road. Although we source products from around the world, EMU Australia’s Platinum Sheepskin collection is still manufactured by hand on the original Jackson’s Tannery site. Every boot in our Platinum Collection is hand crafted in our Australian workshop from fine, A-Grade Australian water-resistant sheepskin. Every pair is carefully cut, moulded, folded stitched and trimmed to create the finest sheepskin footwear available. Keep an eye out on our website for our Australian Made logo. This guarantee’s that your sheepskin boot has been hand-made with love in our workshop at the heart of EMU. Our Platinum Collection is a truly iconic style. 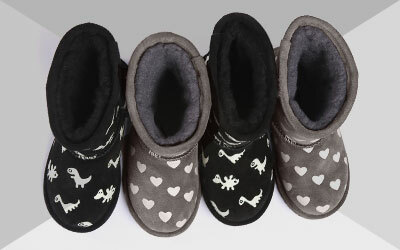 Our famously comfortable Platinum boots surround your feet with the natural fibres of double face sheepskin delivering a warm, soft and durable fit. Technically advanced, they are water resistant and featured a removable anatomically correct sheepskin lined insole, moulded heel cup and rubber outsole for unmatched comfort. Our ratings show exactly why this collection is so loved, with 5* ratings on fit, quality and comfort.